I get pretty skeptical about (some) food trends. I balk at quinoa. I loathe smoothie bowls. Please don’t try to tell me how awesome chia seed pudding is, because I promise, it’s not as good as chocolate pudding. And don’t even get me started on the gluten-free craze. So you can maybe understand my skepticism over the latest internet enthusiasm for “sheet pan” dinners. Because, come on – is throwing dinner on one sheet pan really that great?? Well, the answer is a resounding: yes, yes it is. Which I guess also means I have to admit I was wrong about something. Just don’t tell my husband. This sheet pan dinner was incredibly delicious and easy, and is equally awesome for a weeknight dinner or Shabbat. I will admit that I thought to myself: wow, dinner is totally done! Now, what should I do? (Pour myself a glass of wine of course). So go ahead – get excited about the convenience and awesomeness of a sheet pan dinner, and try adding your own favorite flavors and veggie combinations. For those wondering, za’atar is a wonderful Middle Eastern spice blend used widely in Israel. I have bought mine in Israel, at supermarkets like Fairway and even online. You can also try making your own. Cut whole chicken down the middle of breasts and flatten slightly. Place on top of foil lined sheet pan. 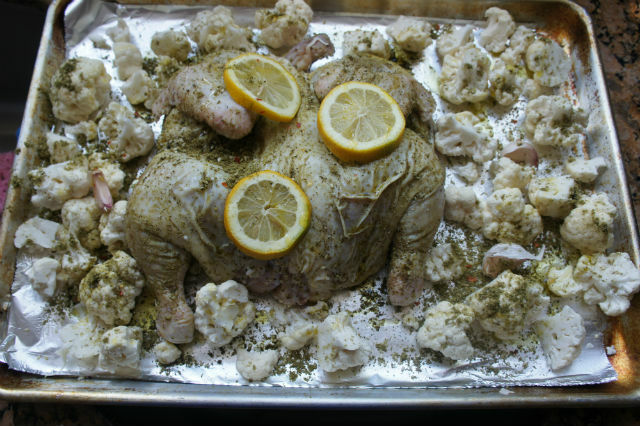 Cover chicken with 1 1/2 Tbsp za’atar, making sure to cover skin, under skin and the underneath side. Places 2-3 slices of lemon underneath chicken skin. If you don’t feel comfortable placing lemon inside the chicken skin, just place on top. Place remaining lemon and 1 garlic clove underneath chicken. Spread cauliflower all over the sheet pan and top with remaining 1 Tbsp za’atar and garlic cloves. 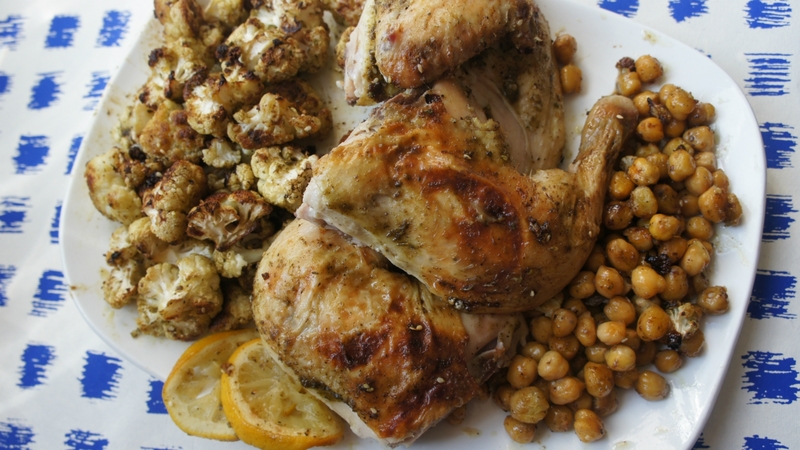 Drizzle the chicken and cauliflower with olive oil and sprinkle with salt and pepper. Toss/rub to coat completely. Roast in pre-heated oven for 35 minutes. Remove from oven and turn cauliflower, which will have shrunk in size slightly. Move cauliflower over to make room for chickpeas. 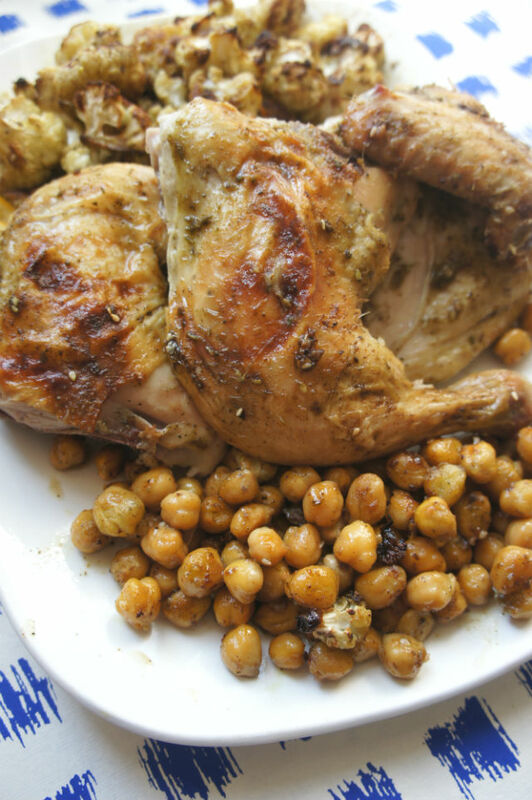 Spread chickpeas on pan and drizzle with a touch more olive oil, and pinch of salt and red pepper flakes if desired. Place back into oven for another 15-20 minutes, or until chicken is crispy and golden and the cauliflower is caramelized to your liking. Serve immediately.